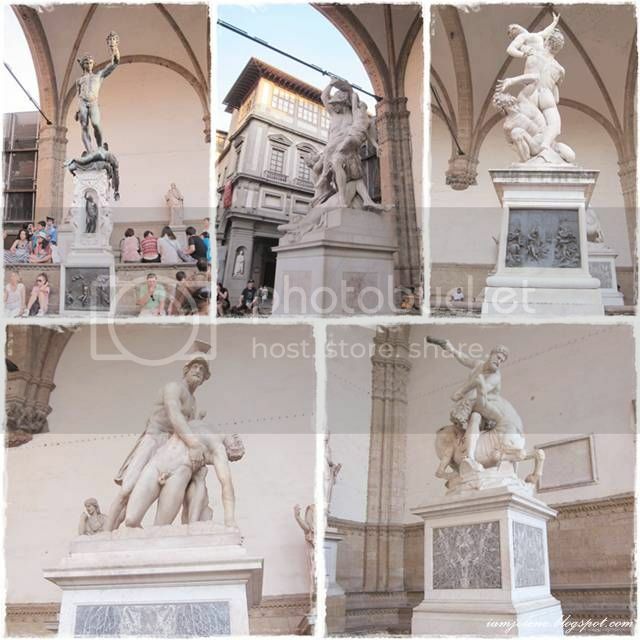 I stopped midway when updating Day 2 of Florence in my previous post and mentioned that the following post would focus on the rest of Day 2 combined with Day 3 as a consolidated post of museums and churches in Florence. Well, I overestimated myself again. This post would simply continue on from where I left off in Day 2. After jumping like crazy hyenas at Porta San Niccolò (Torre San Niccolo), our next stop was to check out Ponte Vecchio. 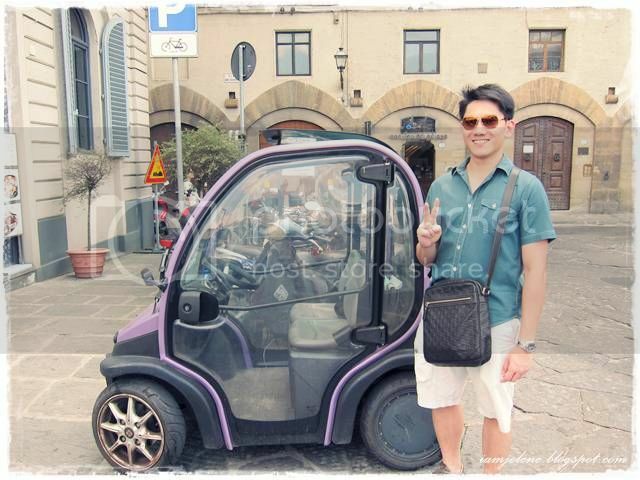 Mini electric cars are ubiquitous in Italy. They are exceptionally cute when driven by big-sized Italians. I think they would look cute when driven by us Asians too. 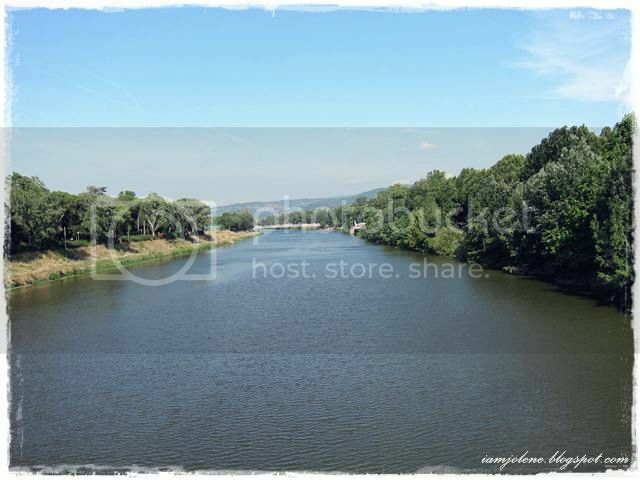 I was intrigued by the range of landscape and vegetation along the Florence river, Arno. We observed sandy grounds which almost look like a beach. The people treated it as a beach too. Just about a few lamp posts down was an arid land with sparse vegetation and no people but lots of birds. Without any gradual change, the view of the sparse vegetation was soon replaced by tall plants. It was as if a giant drew an invisible line on the ground and planted different plants on the plots. The variety was all rather interesting. We were not to far from Ponte Vecchio, a colourful Medieval stone closed-spandrel segmental arch bridge which is the oldest bridge in Florence. 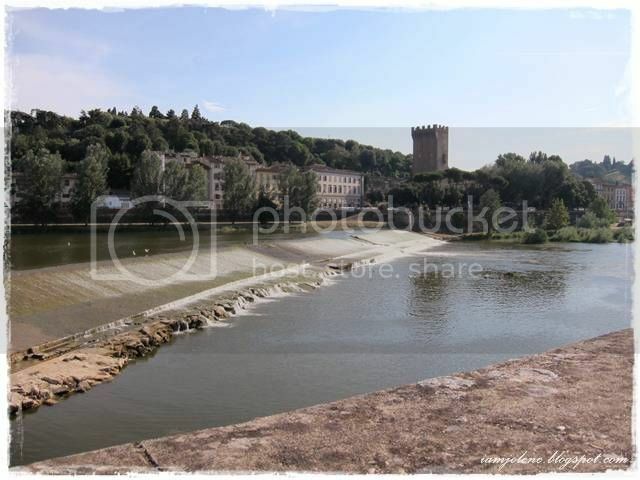 It is believed that the bridge already existed during the Roman times. Its current appearance dates back to 1345 when it was built to replace a bridge which was destroyed by a flood. Houses were built on the bridge, a common practice in large European cities during the Middle Ages. In the 15th century these shops were greengrocers, butchers, fishmongers. Today, the houses and shops had been converted into shops selling a wide assortment of jewelry, ranging from affordable modern jewels to pricey antiques. It was half past two and the hubz was complaining about his rumbling tummy so we had to peel ourselves from the river walkway, enter the alleys and pilfer for food... I meant looking for an eatery. We decided to eat light so as to enjoy a heavier dinner later as the timing was a little off. 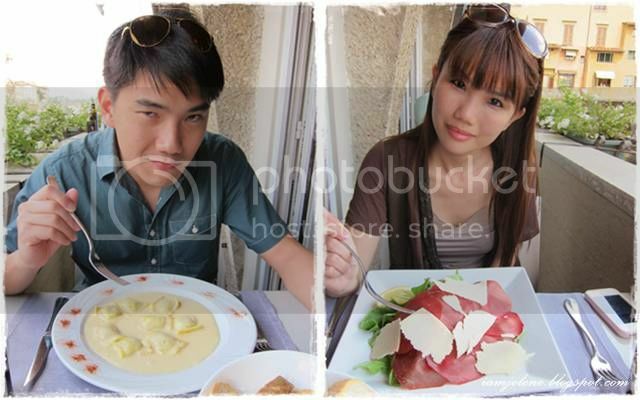 We were always eating at weird timings in Italy. The waiter showed us to our seat which was by the open window. When we saw the view of Ponte Vechhio, we did not even care that the section he brought us to was not air-conditioned. 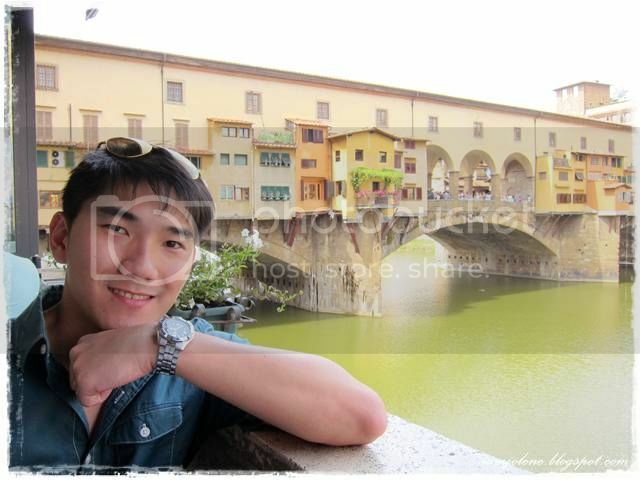 I chose the seat facing the unobstructed view of Ponte Vecchio only to realise that my backdrop for photo-taking wasn't as nice as kh's. Hence, we swapped places after kh had a shot with Vecchio. Check out the crowd at the 3 arches. I wondered if we could get a spot there for photo-taking later. Did you know? 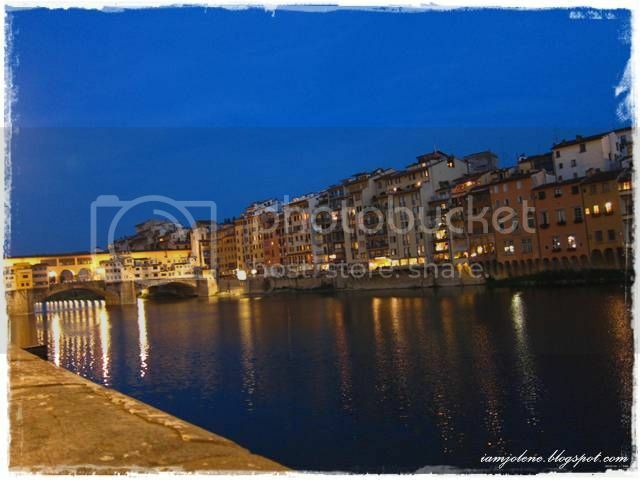 The Ponte Vecchio was the only bridge in Florence that survived the Second World War unscathed. Rumour has it that Hitler found so much beauty in the bridge that he made an express order for it not to be destroyed. Well, historical rumours and gossips are just so interesting! What used to be my backdrop. We hoped that the lunch would be as gorgeous as the view we were having. We were a little clueless about how to eat the bread. Bottles of olive oil and vinegar were served with the bread but we had no dish to pour them into. 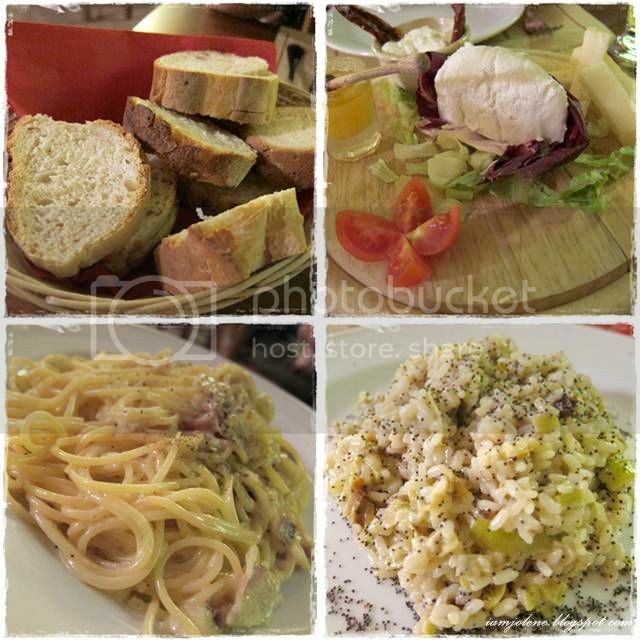 When we dine at Italian restaurants in Singapore, we would always be served a little dish of olive oil and vinegar. 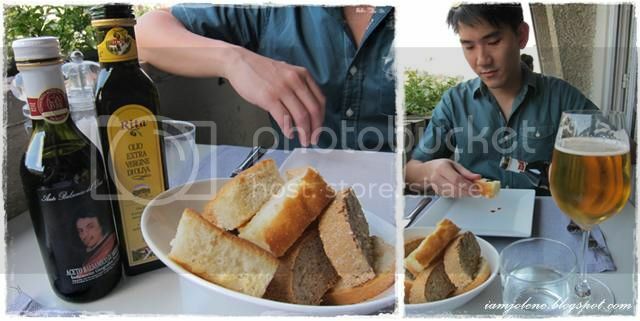 Kh thought that the way to eat bread with olive oil and vinegar in Italy was to pour them straight onto the bread and did just that. Does anyone have any idea if what he did was right? 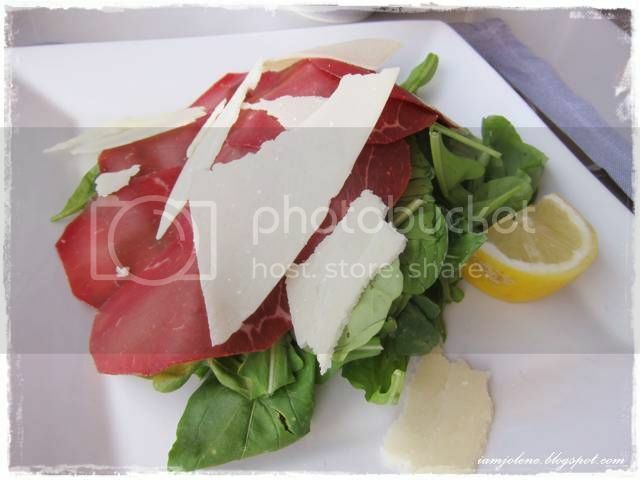 Carpaccio Di Bresaola-- Dry Salted Beef Carpaccio with Rucola and Parmesian Cheese. 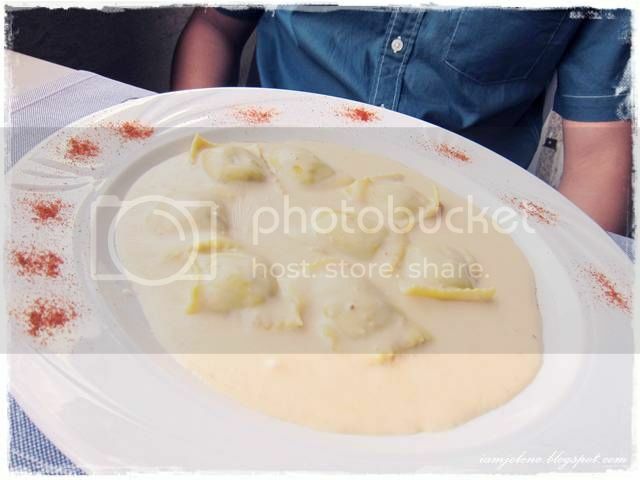 Ravioli (Ricotta e Spinaci) Ai Quattro Formaggi e Tartufo-- Ricotta Cheese with Spinach Stuffed Ravioli with Four Cheeses and Truffle Cream. Kh was doing that stupid kiam pa Ah Beng expression again. Can't stand it! Btw, kh said that was the best pasta he had ever eaten. I thought that it was quite good too. Firstly, kh and I aren't ravioli people. We aren't Bella from Twilight, you see. Secondly, I could never ever finish a whole plate of pasta in cream sauce. No matter how hungry I am, I would get so sick of the rich, creamy taste to finish a creamy dish of pasta. This ravioli in truffle cream that kh had was delicious with obvious hint of truffle, not those artificial truffle oil taste but actual truffle. He finished all the cream sauce without feeling that it was too rich and oily. 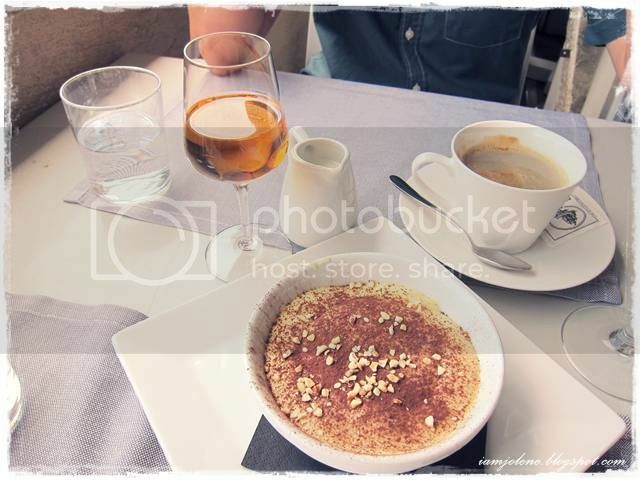 For dessert, we had dessert wine and creme brulee. I didn't like the dessert wine as it was too heavy. It tasted a little like sweet whiskey neat. The waiter recommended it but I'm not blaming the waiter as I liked his affable service. 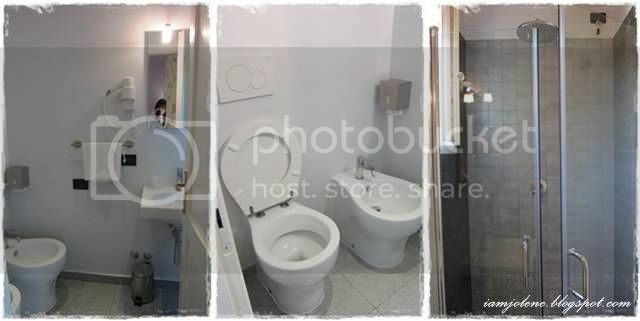 The restaurant's toilet was located downstairs. It felt like an art gallery there. The female sculpture indicated where the ladies was though there wasn't a male sculpture to indicate the gents. 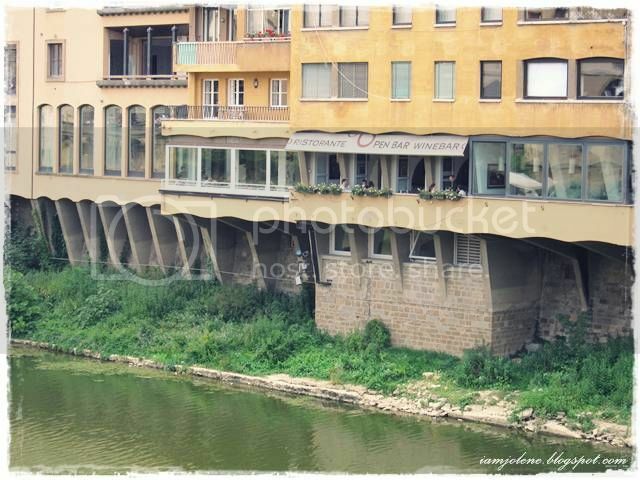 I was browsing the restaurant's official website and learnt that they have apartments too! 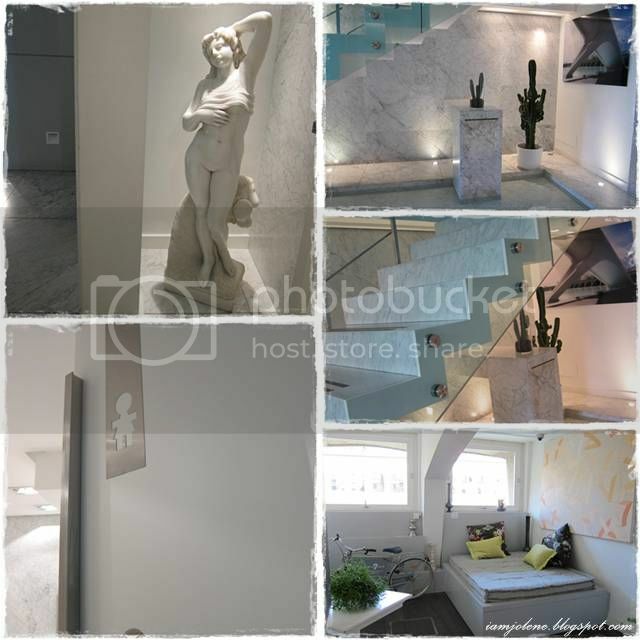 I wonder if the little room at the bottom right of this collage is part of the showroom. 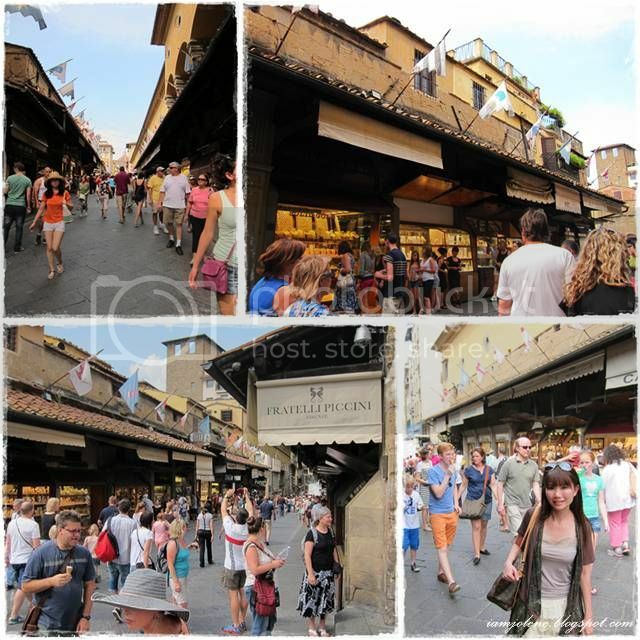 After lunch, we set foot on Ponte Vecchio. It was just that kind of place where people would describe as a tourist trap. All I saw were rows and rows of goldsmith shops. There was a charming little shop selling exquisite trinkets but I wouldn't pay the price they were charging. We reached the arch and this view of the Arno was snapped from the arch. It looked so peaceful in front of the camera lens. It was a totally different story behind the lens. Most of the tourists were considerate in that they wouldn't hold up the space at the arch for a long time. Most just snapped a few pictures of the surrounding and of themselves before smiling at the next group in waiting and "let the space out". Of course there were also some who simply stood there and chatted and even sat on the ledge like they owned that space. No matter what, I wanted a shot of the Golden View Open Bar before we moved off. Could you spot where we were sitting for lunch? Finally making our mark at Ponte Vechhio. 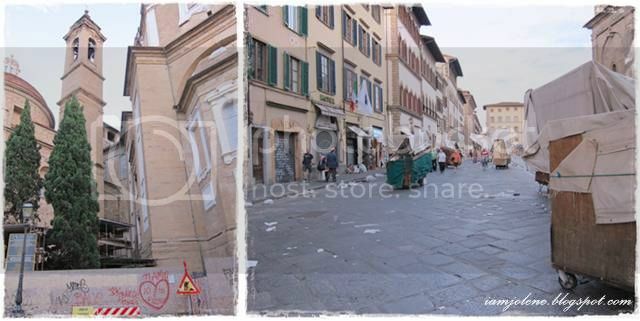 The picture below shows the Corridoio Vasariano (The Vasari Corridor) from Palazzo Vecchio to Uffizi. 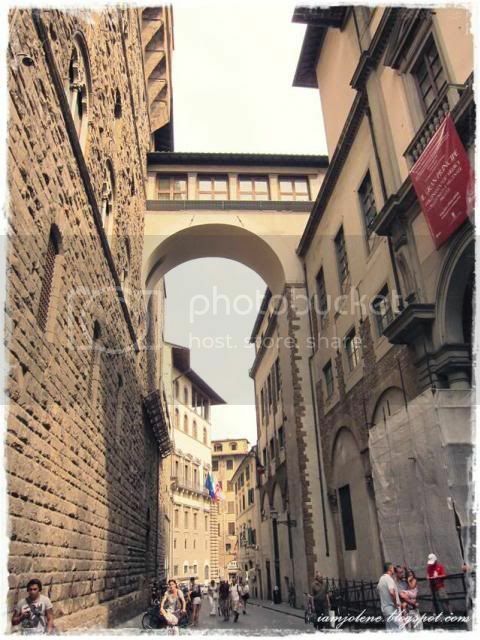 The whole corridor is an elevated enclosed passageway which connects the Palazzo Vecchio with the Palazzo Pitti. The idea of an enclosed passageway was motivated by the Grand Duke's desire to move freely between his residence and the government palace, when, like most monarchs of the period, he felt insecure in public, in his case especially because he had replaced the Republic of Florence. 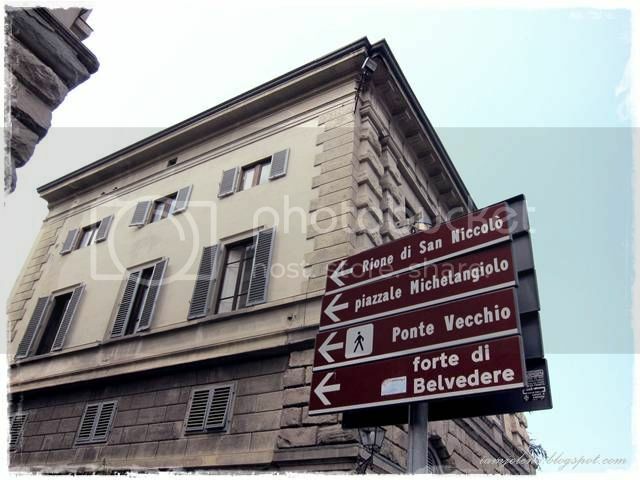 Moving away from Ponte Vecchio, we reached a minor piazza which we could not even locate on the map. 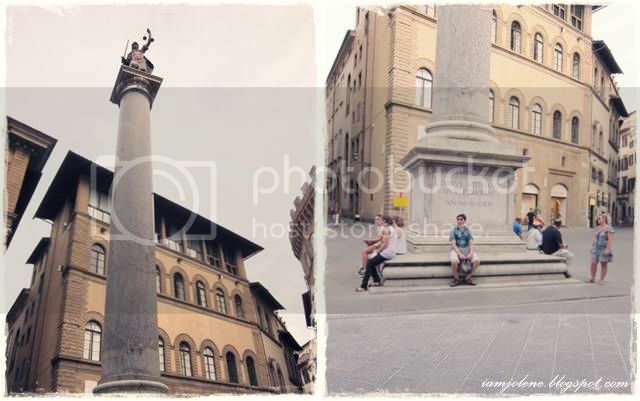 Piazza Santa Trinita is a triangular square taking its name after the church of Santa Trinita. 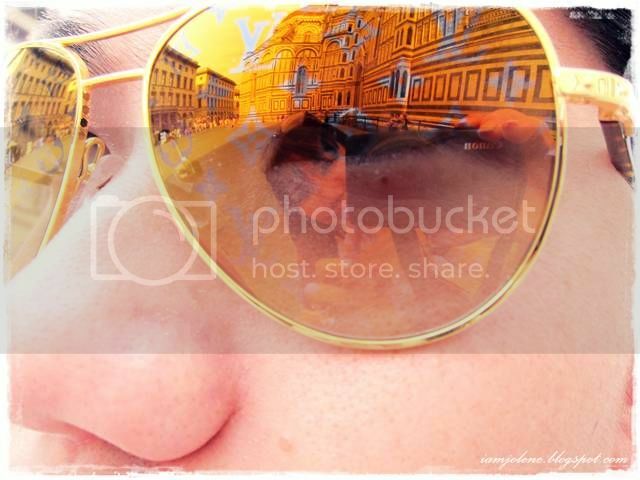 Reflection shot of Basilica di Santa Maria del Fiore and me through his LV. I LURVE this pair of aviators a lot. It's unisex but somehow I feel that it fits me a lot more than him. He refused to let me have it. 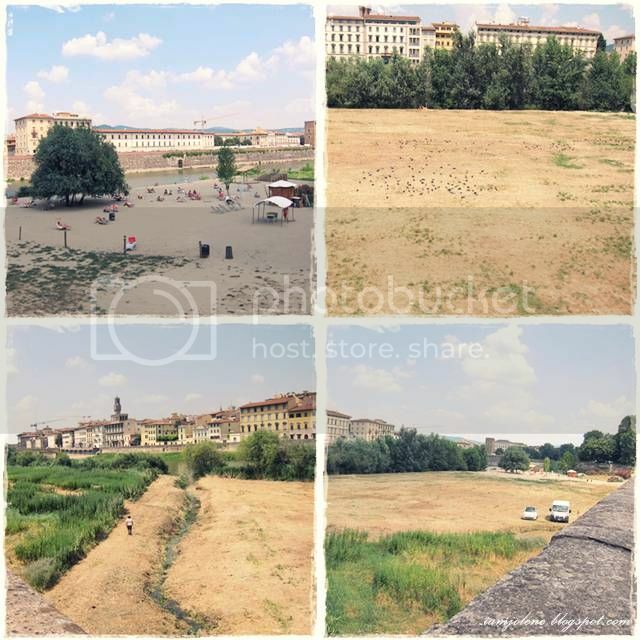 The day before, we were at the area outside Palazzo Vecchio. 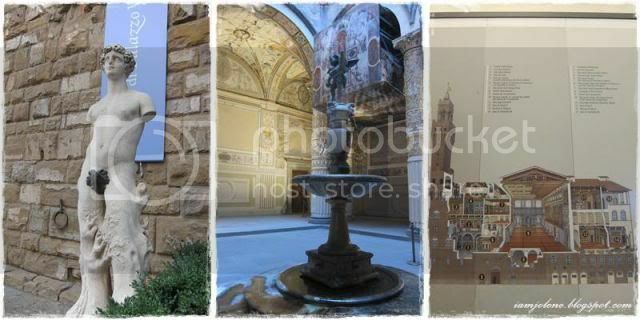 This time, we were going to visit the museum --Museo di Palazzo Vecchio-- which would be open till midnight. That's quite cool. All museums should be like this as well so that tourists could visit outdoor locations in the day and museums at night. 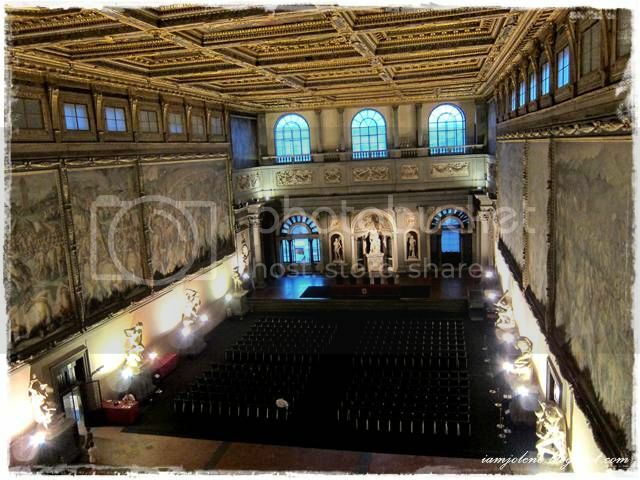 Museo di Palazzo Vecchio is ranked as #20 attraction in Florence with a 4.5-star rating. I enjoyed my time at this museum. 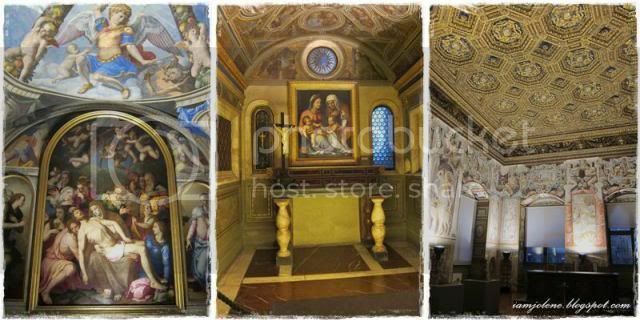 The artwork and fresco in there were simply awe-inspiring. 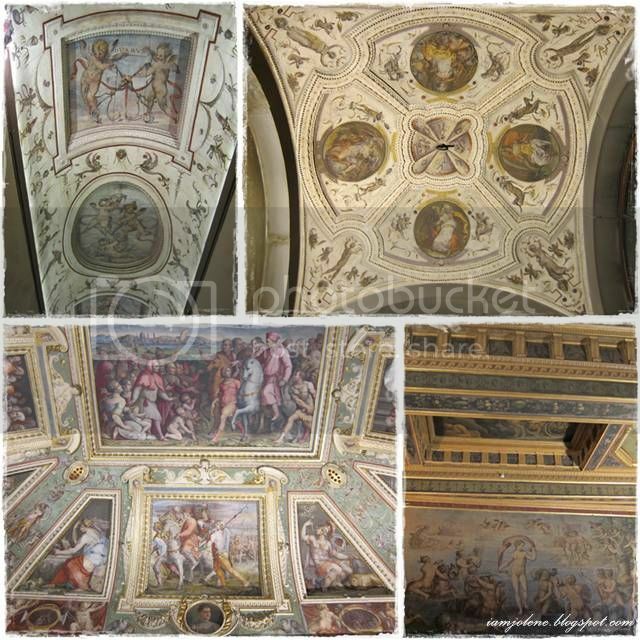 Every single room had beautiful and ornate paintings on the ceiling that after a while, I stopped snapping pictures and admired them with my eyes instead of through the camera. Some paintings told stories of long ago. Some paintings were renditions of famous paintings. Some paintings were simply intriguing. In addition, period pieces in some of the rooms gave a feel of how the rooms were really used in the past. 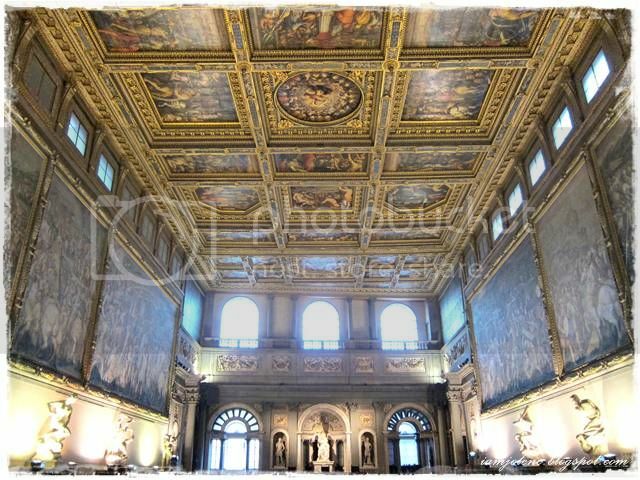 On the walls are large and expansive frescoes that depict battles and military victories by Florence over Pisa and Siena. On the north side of the hall, illuminated by enormous windows, is the raised stage called the Udienza, built to receive citizens and ambassadors. From one of the windows, we saw where we were in the day time. 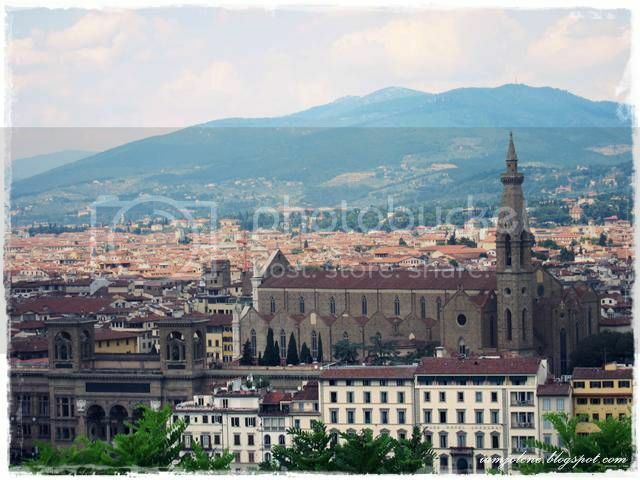 Could you spot the church of San Miniato al Monte and the Statue of David at Piazzale Michelangelo? Of course you could. I've circled them for you. There was an exhibition by Zhang Huan titled Soul and Matter. We overheard a Chinese tourist guide explaining to a tour group how Zhang Huan used ash for many of his art work as it has metaphysical representation. Most of the ash artwork are busts of conservative size. 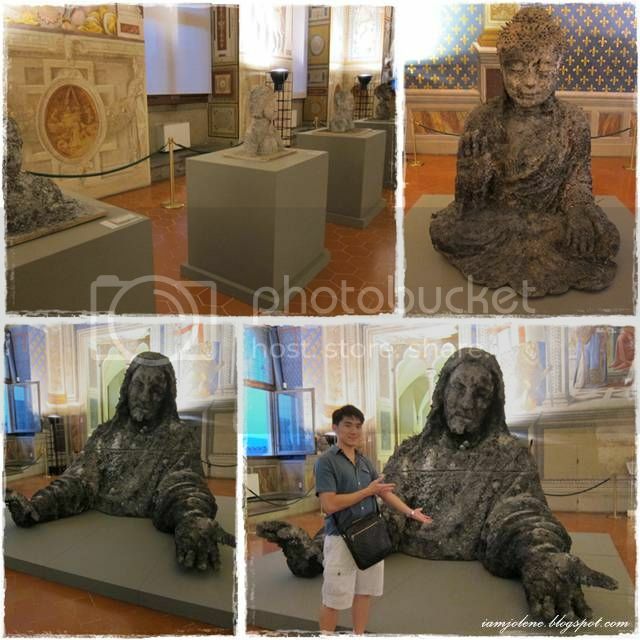 Hence when we saw the immense ash sculptures of Buddha and Jesus Christ, we were amazed. Left: Judith Beheading Holofernes. I really love strong women. 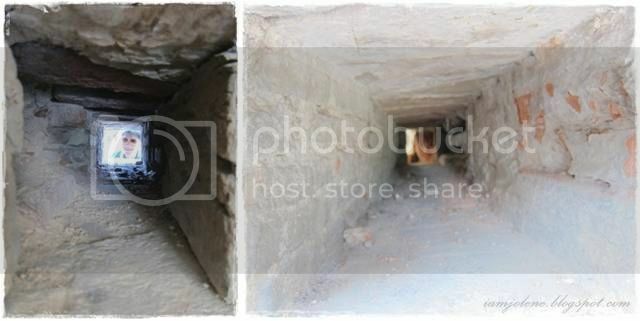 Right: A chamber that reminds me of how a chamber in Laputa (a fictional place from the book Gulliver's Travels by Jonathan Swift) would look like. 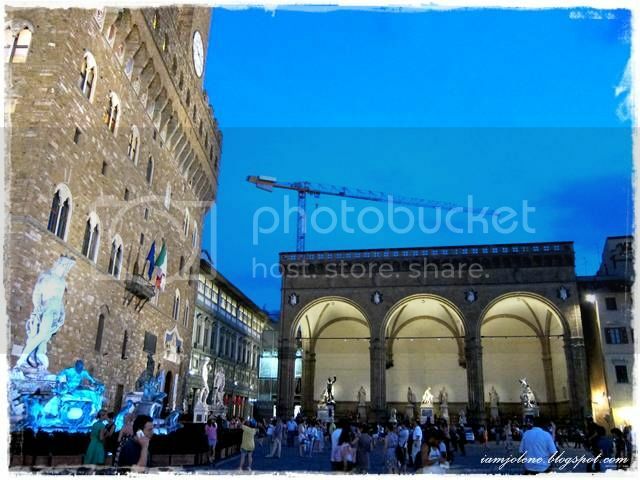 We finished touring the museum at 9 plus and caught night shots of Piazza della Signoria. 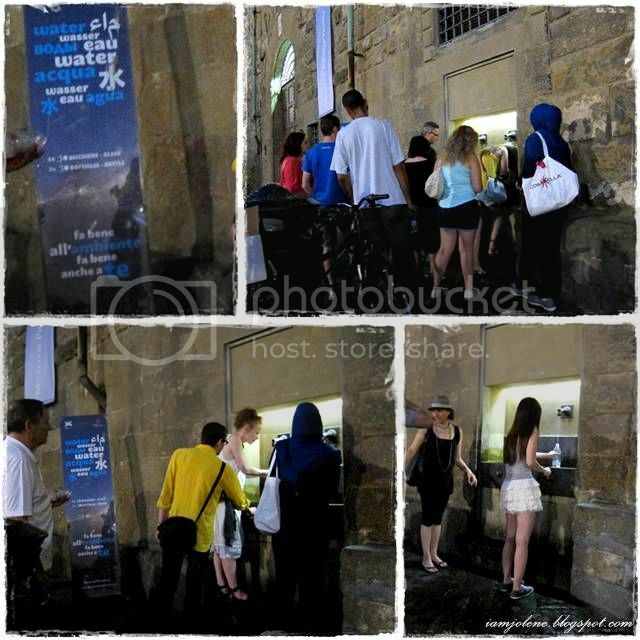 Free water from the mountains flows out from taps and fountains all over the streets in Florence. While many people filled their bottles or drink directly from these taps and fountains, kh and I decided not to take the risk but to buy bottled water whenever necessary. I was actually a little disgusted by the dirt, moss, fungi and whatever green and brown stuff I see on the taps and fountains. This free water area looked pretty clean as somehow the poster lulled us into a sense of security that the water was indeed safe. There was even instructions on how many times to press the button for various sizes of bottles. So cool! 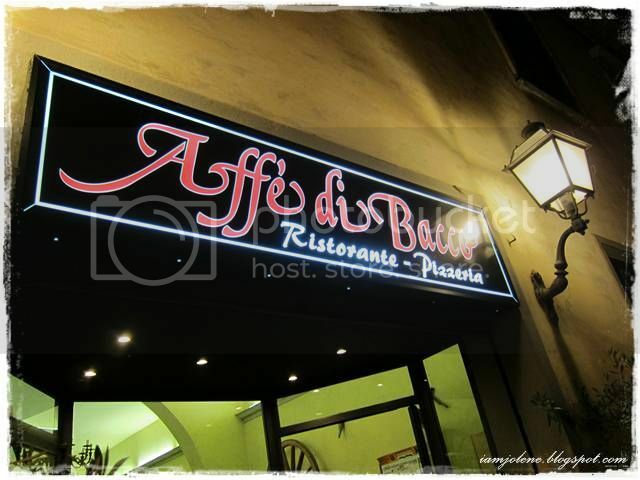 We had dinner at Affe di Bacco which was a stone's throw away from our hotel. It was recommended by the hotel's receptionist. 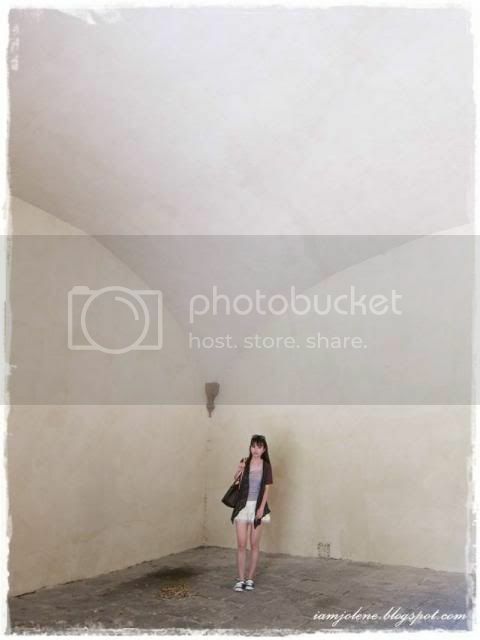 In her very own words with limited English vocabulary, she said , "There is this really cute place that you could try." I thought that was really cute. Ranked #337 with a 4-star rating on Trip Advisor, this is not your usual tourist restaurant. It had a neighbourhood feel, just the sort of place that the locals would go. There is a separate menu in English which wasn't updated as told by the waitress. She spent quite some time explaining to us the new dishes on the updated Italian menu in her halting English. Kudos for the effort! We really appreciated that. Somehow, Coca Cola in Italy seems flat and doesn't have a refreshing feel. You know how even people aware of how much sugar Coke has would occasionally drink Coke for that super refreshing feel? Well, the Coke in Italy totally didn't give that feeling. When I asked for ice cubes, the friendly waitress served a dish of ice cubes with 2 wedges of lemon. That certainly did the trick. When the waitress cleared our table, she looked concerned that my risotto was 2/3 done. She enquired if there was anything not to my liking and that she could feedback to the chef. I answered with a smile that I was too full (which was true). It wasn't that the food was no good. It just didn't gel with my taste buds. Nevertheless, we still enjoyed ourselves feeling like a local in this casual restaurant. We were also pleased with the waitress's service. 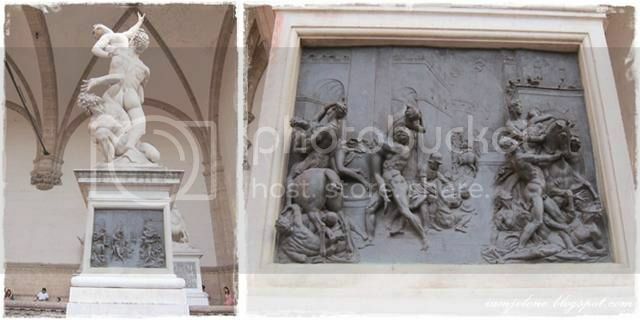 It could get quite boring having consecutive posts on my blog about my Italy trip. Hence, I would take a break from travel posts after this and continue catching up with other backdated posts for the year. I've replied to your comments so do check back on the posts where you left yours. =) Happy work week/ school week to all of you! 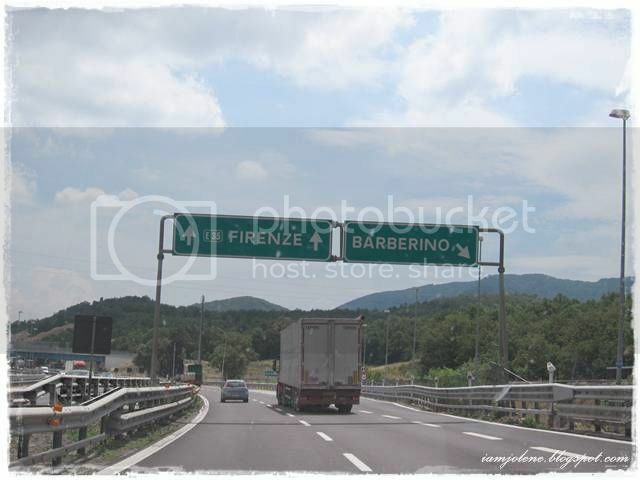 The drive from Venice to Florence took about 3 hours. As usual our trusty GPS, Daniel brought us to the hotel's doorstep without giving us reaction time to find a parking lot. Since there were one-way roads everywhere in the district, we had to make a few rounds before we finally snagged an unofficial lot a stone's throw away from the hotel. 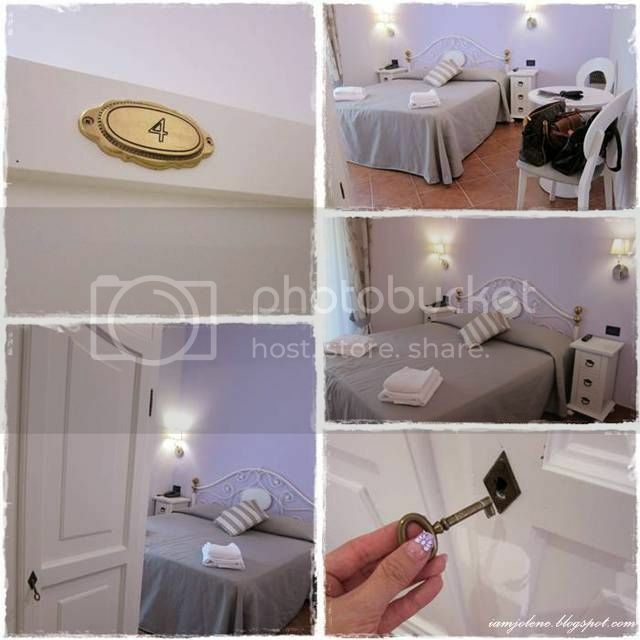 Hotel Ferrucci in Florence was the cheapest hotel for our whole Italy stay. Decent hotels in Europe do not come cheap and hence we were pretty thrilled to pay about €300 for a 4-night stay at a room that looks like this. 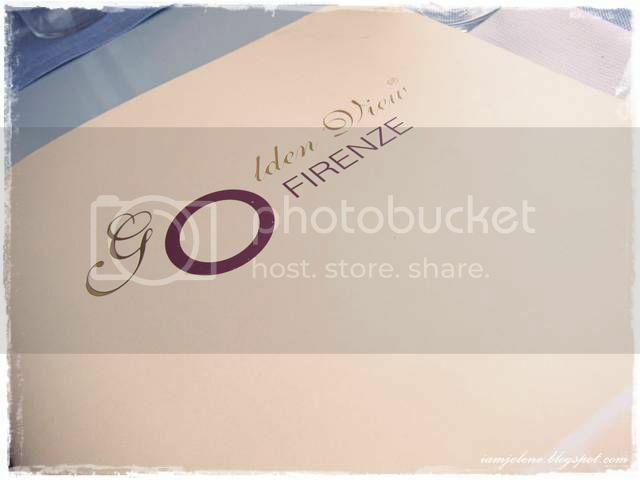 Listed as a 2-star hotel, it is ranked #62 out of 468 hotels in Florence and received an 89% thumbs up based on the reviews written. We were assigned to Room 4. The purple, grey and white theme is pleasing to the eye and the white furniture reminds me of those Parisian furniture. I like the little key that took some finger power to lock and unlock the wardrobe. As usual, we lived out of our luggage and needn't really use the wardrobe. I was simply trying out the antique key to see if it worked. I don't know about many of you reading this but Singaporeans and typically Asians have the culture not to wear shoes indoors. We could not do so for this hotel. Our feet caked with dirt when we walked barefoot and decided to wear our slippers around the room. It was a little inconvenient as I hate to step into the toilet with footwear. Hence, I used wet wipes to "mop" the toilet floor and made it a no-shoes zone. The bathroom is elongated breadth-wise and a little small. But no hotel could beat the size of Hotel Galleria in Venice. We were thrilled to know that our room was the only room with a patio attached. 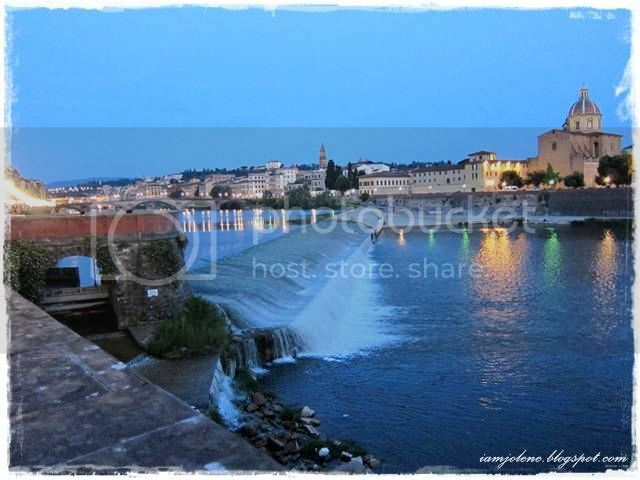 Not like we made use of the patio to sit there, sip wine and count the stars in the dazzling Firenze night sky. (The table and chairs looked like nobody had sat there for months.) 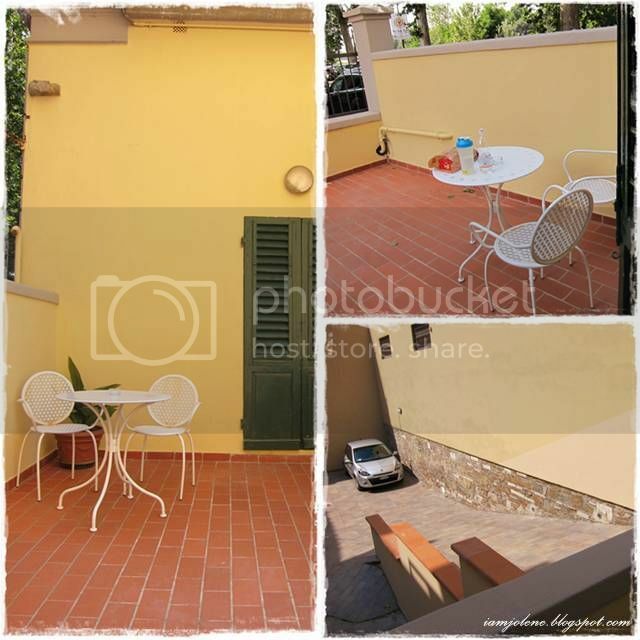 We were more of glad for the convenience of the patio leading straight to the hotel's private carpark. When we checked in, the lovely hotel staff informed us that they had reserved a parking space as requested over the email. It was really a huge breeze dragging our luggage up and down the steep slope straight to and from the car during our check-in and check-out. It was literally a parking lot in our backyard. If you haven't already caught it in my past post, this is the instavideo of Hotel Ferrucci. By the time we settled down, it was already about 4pm. What could we do with half the day at Florence? The timing was neither here nor there to visit attractions that closed at 6 or 7pm. 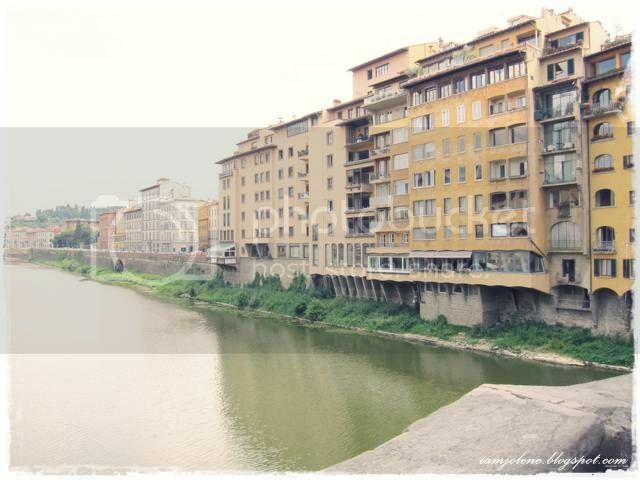 We decided to walk along the Florence River (also known as Arno) and slowly take snapshots of any attractions along the way, have our first meal at Florence and capture the night scenes of attractions in the city centre. Sure sounded like a great plan... only that the weather was scorching hot with the sun mercilessly beating down on our faces, its ray's angling itself exactly in the direction of us walking along the river. The sun was literally in front of us. 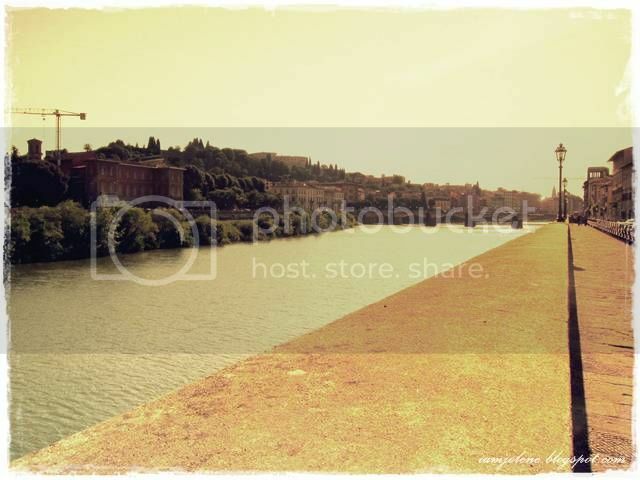 This river scene was taken on Ponte di San Niccolò (Bridge of San Niccolò) with the sun behind us which also meant that the city centre was behind us. Our hotel is located on the right. Yes, you wouldn't have guessed that there are buildings behind those trees right? There were people sunbathing on the concrete "slopes" of the river. Pretty curious to see concrete in the river, isn't it? It reminds me of those huge canal with concrete base. 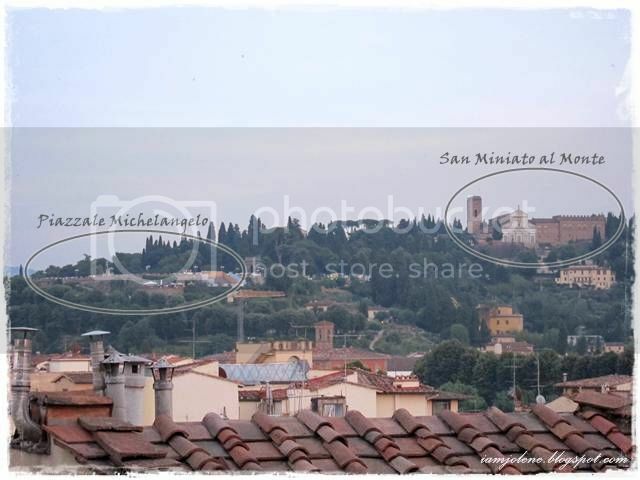 In the background, you could also see Torre di San Niccolo (San Niccolo Tower) located at Piazza Giuseppe Poggi which is slightly down the hill of the famous Piazzale Michelangelo. We thought that the Florence River would make a lovely walk but it was really difficult to soak in the sights with the sun's glare. I took this shot using my sunglasses as a filter. Other than the blinding glare, the soaring temperatures seemed to weigh us down. We always thought that we could survive the heat in Italy as long as it wasn't humid (or so we heard that summer in European countries is hot but not humid like in Singapore and that we wouldn't perspire too much). Well, we possibly excreted a litre of sweat from the walk. By the time we set foot on the fringe of the city centre, we were famished. 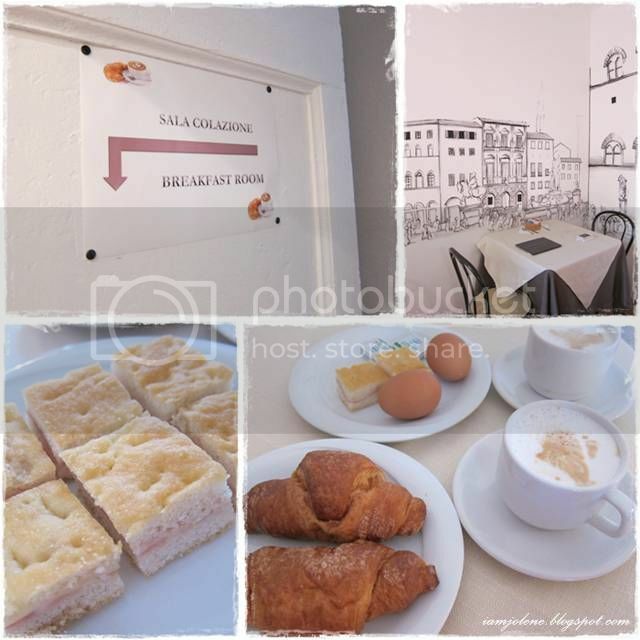 Our last meal was the breakfast served at Hotel Galleria in Venice earlier in the morning. At 6 pm, many restaurants were only opened for their bars and not ready for dinner yet. 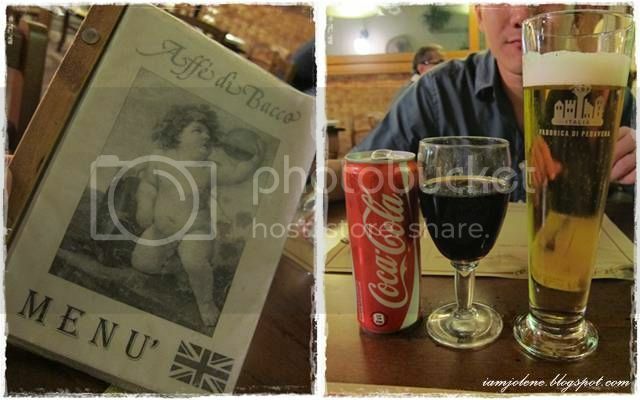 We were elated when Paolo, the waiter at Franceso Vini replied that they were serving dinner. Finally! After a few rounds of being turned away by other restaurants. 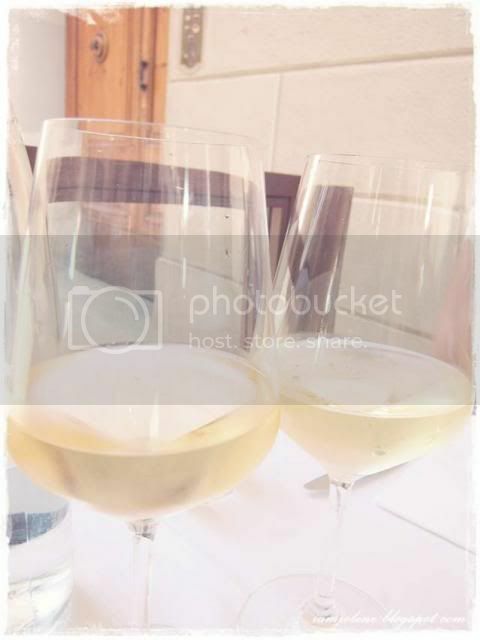 We started off with charming white wine and moscato recommended by our waiter, Paolo. After having a sip at my moscato, the hubz ordered another glass for himself. 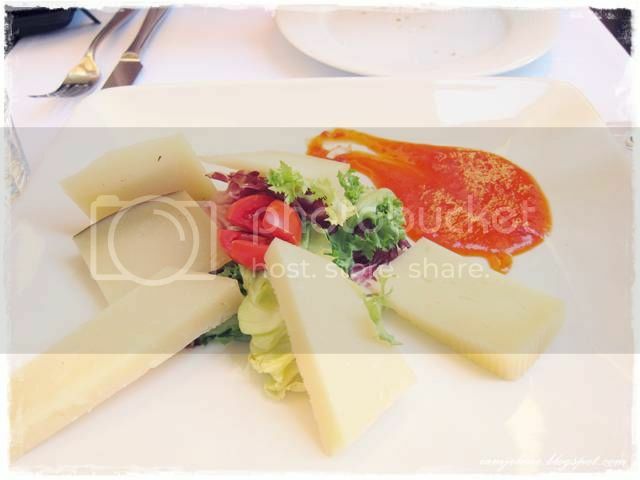 The Selezione di formaggi con mostarde was a selection of mixed cheeses with homemade jams. What looked like chilli sauce was actually a delightful fruit jam. 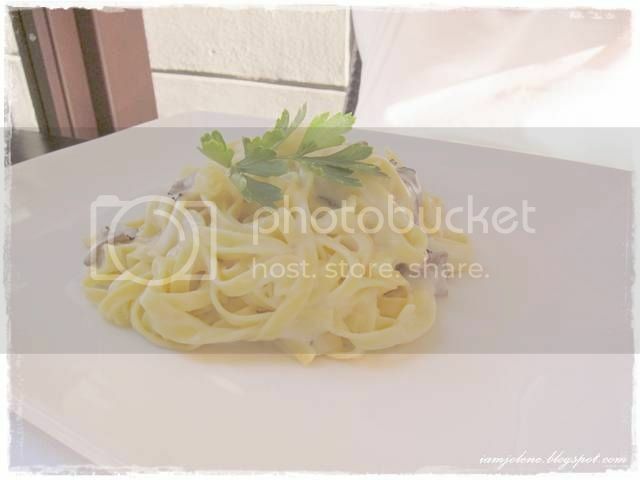 Kh had Tagliolini alla crema di pecorino e tartufo-- Tagliolini of fresh pasta sauteed in a pecorino and truffle cream sauce. 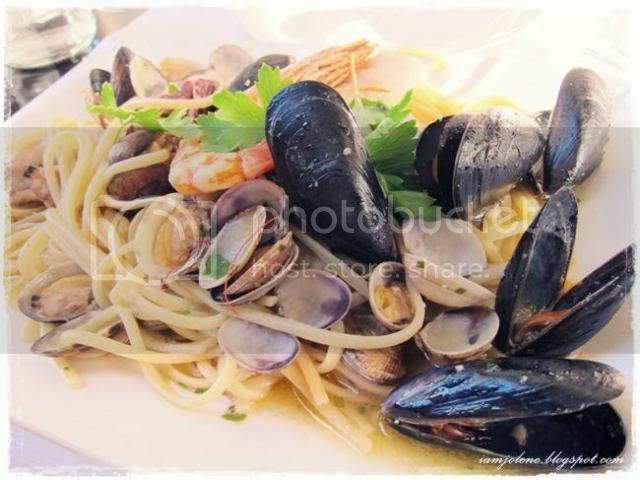 I had Capolovoro di Linguine allo scoglio-- Linguini with mussels, clams, shrimp and calamari sauteed in a white wine sauce. Yes I know. Mussels and clams in white wine sauce for 2 consecutive dinner? I really really love all these shelled stuff in white wine sauce. The people at the next table and the next and the next kept on looking at my dish coz you know why? Check out the next picture. Look at the size of our main course in relation to our bodies. Paolo nearly placed my seafood pasta at kh's side. 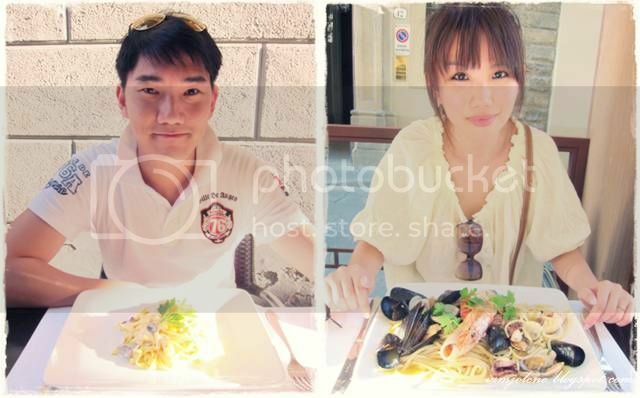 When kh gestured for him to place it at my side of the table, Paolo apologized and said "The missus can eat a lot". I couldn't finish a quarter of of my food in the end but I made sure I slurped up all the white wine sauce as usual. 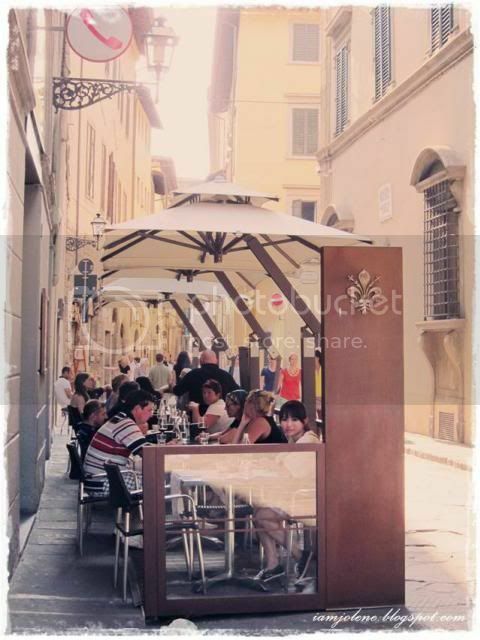 Al fresco dining by the busy sidewalk at a lovely restaurant was one of the highlights of our first day in Florence. 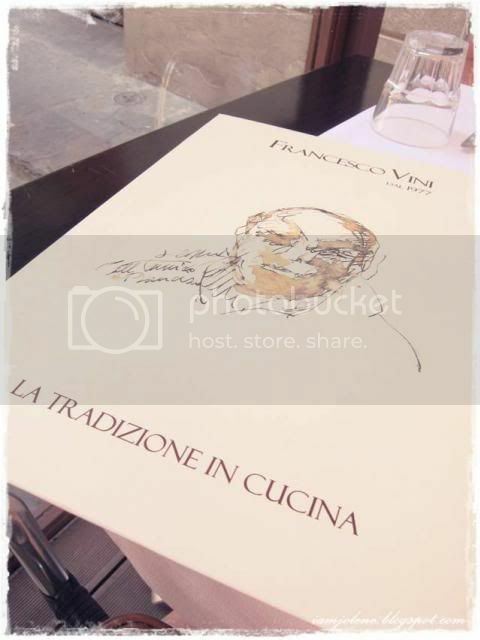 Prior to this meal, we didn't know that Francesco Vini has a 4.5-star rating on Trip Advisor. It seems like many eateries and hotels in Italy pride themselves for being listed on TripAdvisor with fond reviews written of their food and services. No wonder Paolo served us so well and even wrote down his name when I asked to take a picture of the menu to remember the dishes we ordered. (Hehehe... I spied his name being mentioned on Trip Advisor.) He gave a surprise look at first and when kh told him that I would usually write about my dining experience. He nodded his head with a smile and returned shortly with the menu. He enlightened us about the dishes we ordered, the culture in Italy and also asked about our experiences in Florence so far. Most affable service to complement the delicious food, I would say, that we tipped him. 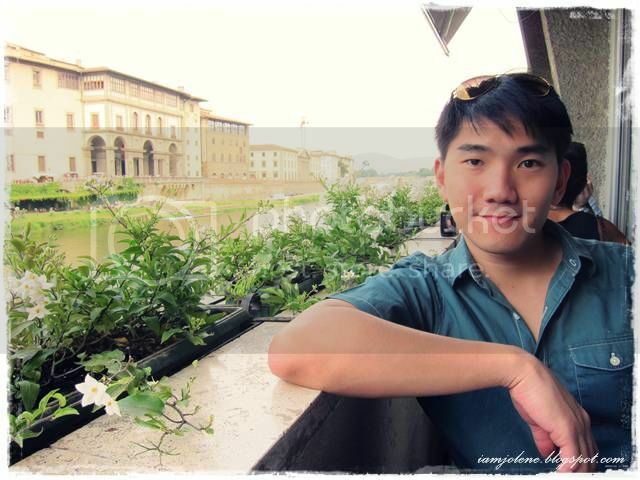 He was so thankful for our tip that his mannerisms sort of made me suspect that there isn't a tipping culture in Italy. It was only from a tip app which I downloaded on my iPhone did I learn that it isn't compulsory to tip in Italy and that the bread served at restaurants act as a "tipping fee". Nevertheless, we continued tipping serving staff who exceeded our expectations during the trip. Throughout our stay in Florence, we frequently walked past this alley and would look in to see of Paolo was at the restaurant. 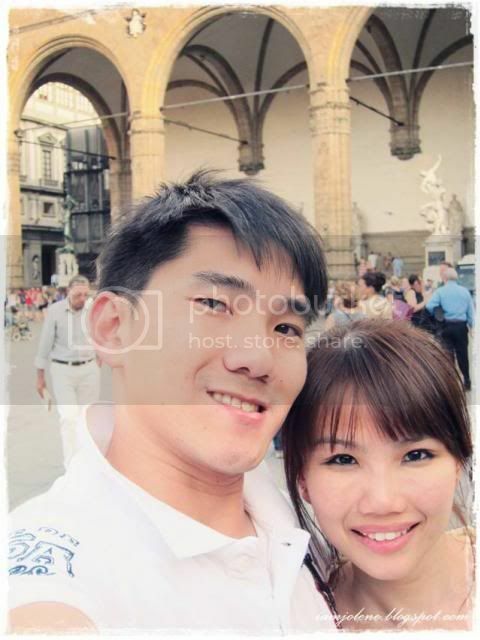 Also throughout our stay in Florence, kh would ask if we should eat at "Paolo's" again but we decided to try out more restaurants rather than to keep going back to the same one. After our 1.5 hour dinner, it was already 8pm. 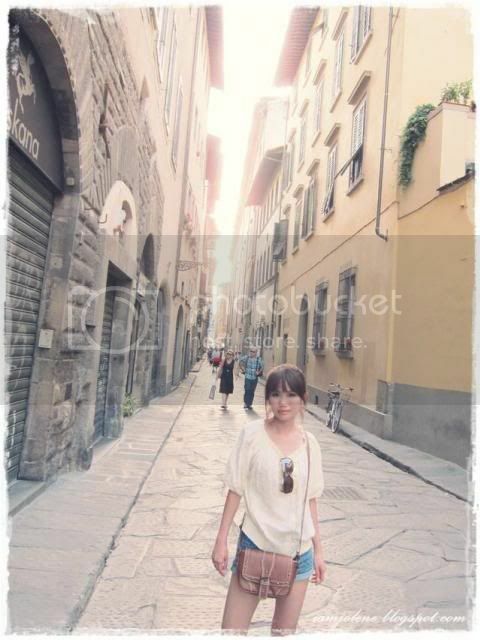 We slowly made our way to Piazza della Signoria. Instead of taking photos of the night scene, the sun had yet to set in the long summer day so we took day shots instead! 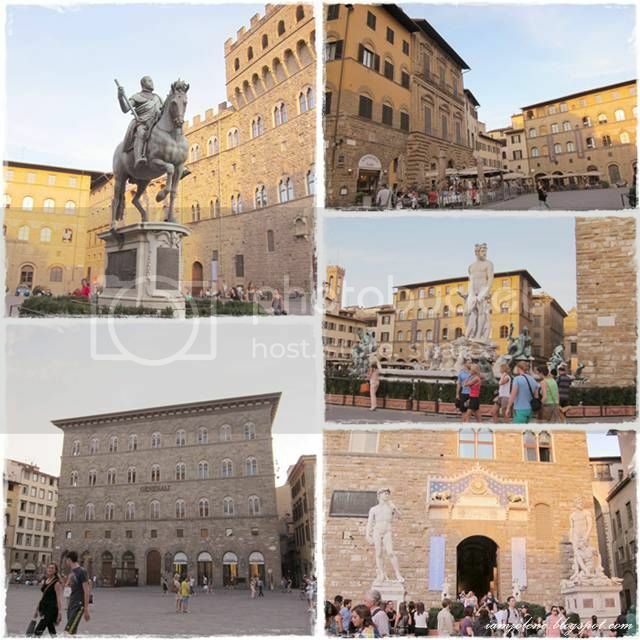 Piazza della Signoria, containing various attractions in one stop, is such a dynamic space that we found ourselves wondering back multiple times during our stay in Florence. 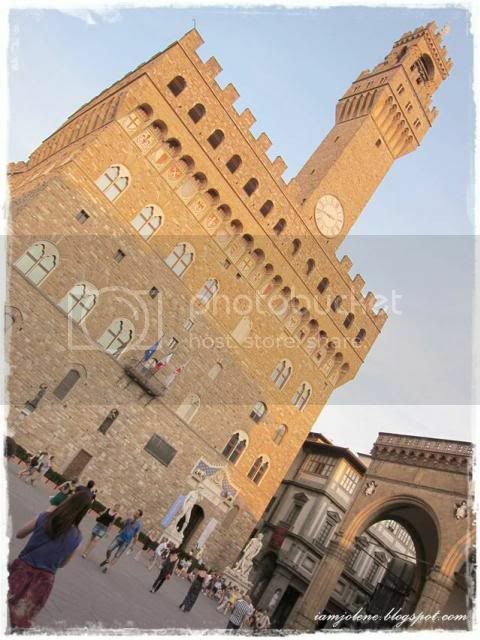 The Palazzo Vecchio ("Old Palace") is the town hall of the city. 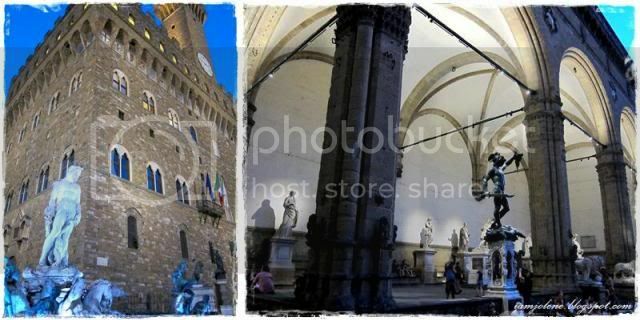 Overlooking the piazza with its copy of Michelangelo's David statue as well the gallery of statues in the adjacent Loggia dei Lanzi, Palazzo Vecchio is one of the most significant public places in Italy. I just hope they get the clock working again coz it was supposed to depict 8:20. 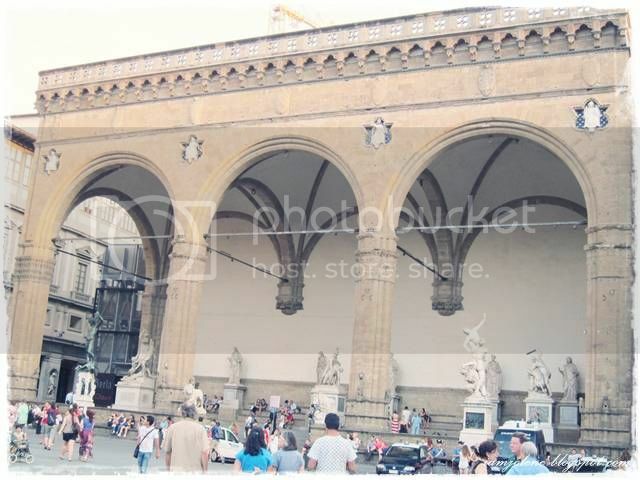 The Loggia dei Lanzi, also called the Loggia della Signoria, is a building on a corner of the Piazza della Signoria, adjoining the Uffizi Gallery. It consists of wide arches open to the street and is effectively an open-air sculpture gallery of antique and Renaissance art. I read this place is strongly recommended for students on a backpacking budget to view replicas of famous sculptures without having to pay to see the actual ones housed in various museums. 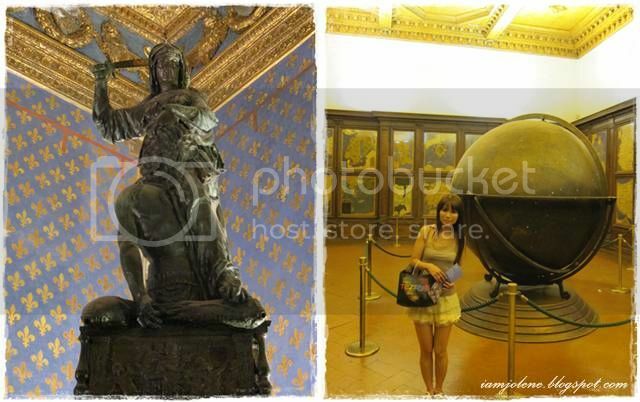 I was totally intrigued by the bronze statue of Perseus by Benvenuto Cellini (see top left) which shows the mythical Greek hero holding his sword in his right hand and Medusa's decapitated head on his left. What seems like blood and other gore gush from the head and the neck of the dead Medusa. 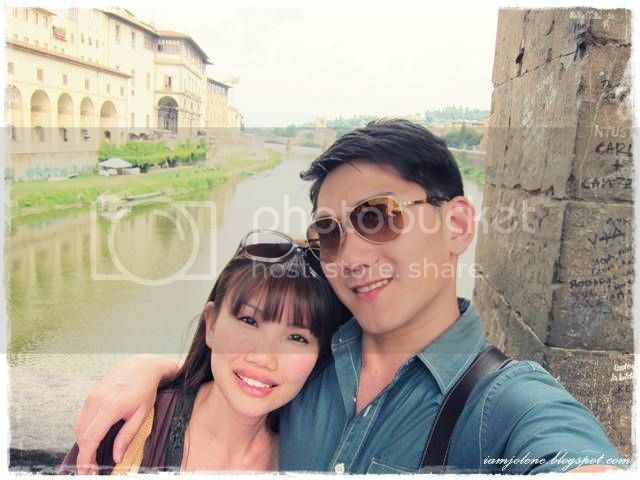 A self-taken shot just to depict us at Piazza della Signoria. 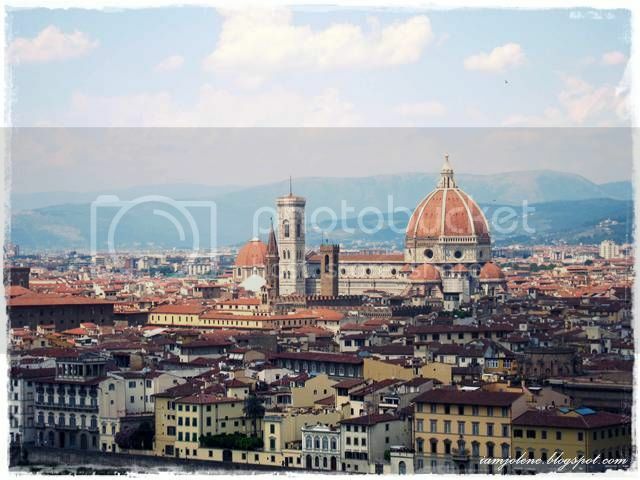 The Basilica di Santa Maria del Fiore (Basilica of Saint Mary of the Flower) is the main church of Florence, Italy. 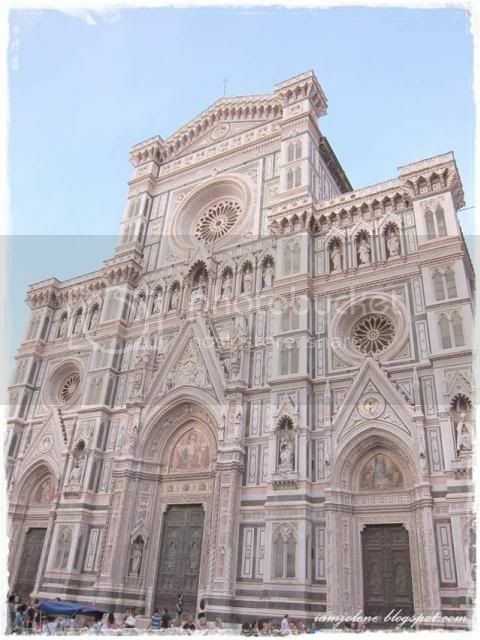 It is also referred to as Duomo di Firenze which is its original name. 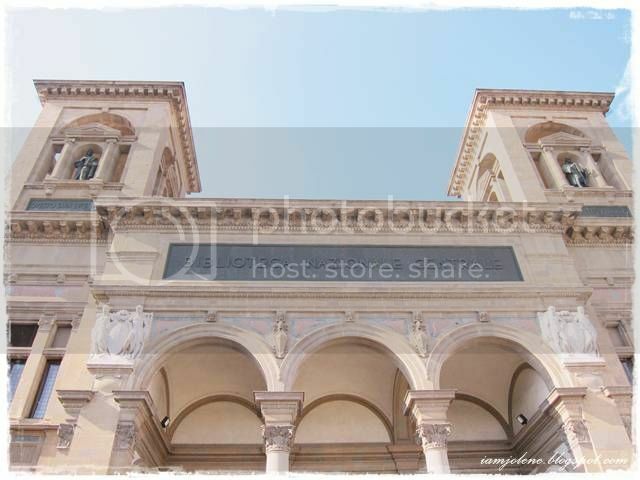 The exterior of the basilica is really beautiful. It has an elaborate 19th-century Gothic Revival façade with ornate polychrome marble panels in various shades of green and pink bordered by white. In the backyard of every beautiful city, uglies thrive in the form of vandalism, graffiti and litter. Graffiti truly mar the beauty of this ancient city. Unlike in Paris whereby graffiti often exist in the form of street art, the graffiti in Florence and Italy in general are just tag, the most basic form of graffiti with spray paint. The sun set at about 9 and by that time, we were quite wearied from the long walk to continue snapping outdoor shots of the city centre. Moreover, the basilica is further away from our hotel and the walk back would be exhausting. Ponte Vecchio was still so far away... You would see more about this touristy place in later parts of Day 2 updates of Florence. By the time we returned to the hotel, it was 10:10 pm. We walked a total of 4 bridges along the river back to our hotel. If you looked at the map of Florence, that's a hell long of a walk. 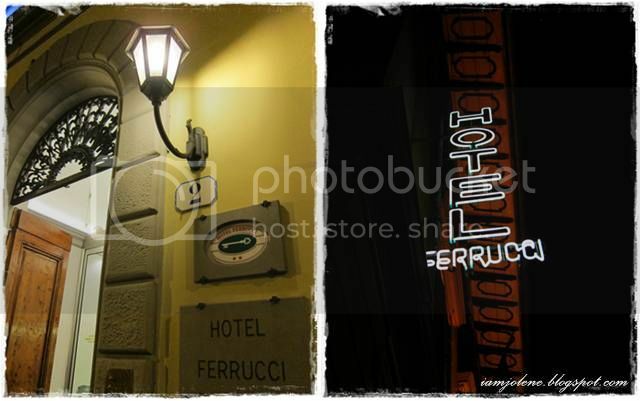 I've never loved the signboard "Hotel Ferrucci" as much as that night. Complimentary breakfast was served daily in a little room at the basement of the hotel. We chose that corner seat every morning if it wasn't taken coz I loved the illustration on the wall. There wasn't too much of a variety of food but it was sufficient energy for us to tide through the walk to the city centre. We ate lots of hard boiled egg white and that little oblong pieces of bread with ham every morning. 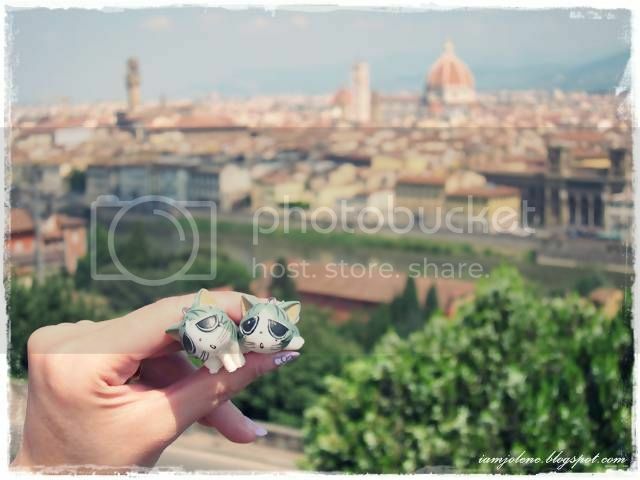 We decided to kick off the day with a visit to Piazzale Michelangelo and the area around that hill. 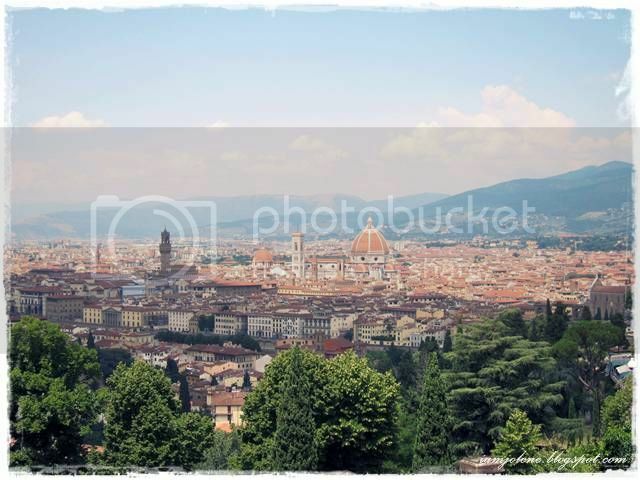 That whole hilly area was just a few roads down from our hotel and we felt that it was a brilliant day to be taking photos of Florence city centre from atop the hill. At the foot lies Porta San Niccolò (Torre di San Niccolo). Kh wondered why I took pics of yucky stuff that grew in nature. I like how there is beauty in some places that look unkempt and forgotten. Oh and there was an owl hooting in that arch that resonated throughout. It was hauntingly beautiful. 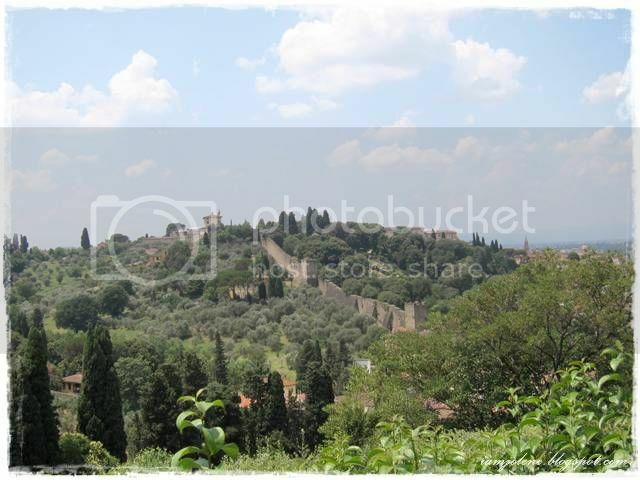 We soon realised that it was more than just a little trudge up to Piazzale Michelangelo and then, to the very top of the hill where San Miniato al Monte stood. No wonder everyone recommended getting there by bus. We thought we were lucky that the hill was near our hotel. By the time we reached Piazzale Michelangelo, kh discovered he wasn't properly attired for the walk up. Truckloads of tourists poured forth from ginormous tour buses staring at these two idiotic Singaporeans who decided a walk up the hill was prudent. The other handful of people who thought that the walk/ run up the hill was prudent were the brisk walkers and runners clad in their spiffy running gear. 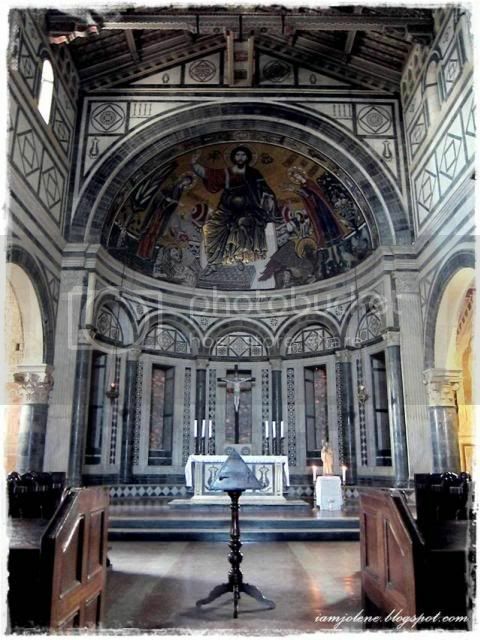 Ranked as the #2 attraction in Florence on Trip Advisor, San Miniato al Monte (St. Minias on the Mountain) is a basilica in Florence, standing atop one of the highest points in the city. 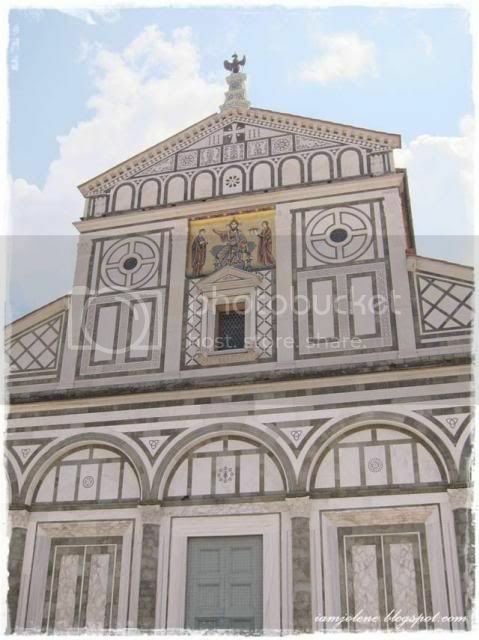 It has unsurpassed view of Florence city centre and has been described as one of the finest Romanesque structures in Tuscany built between the 11th and 13th centuries. Surprisingly, there weren't many tourists around for a #2 attraction and the basilica was almost empty. It was to close at 2pm that day and it was fortunate that we reached there at about 1 pm. The basilica's opening hours during summer is typically 7am till sunset so I'm not too sure why it closed at 2 pm that day. 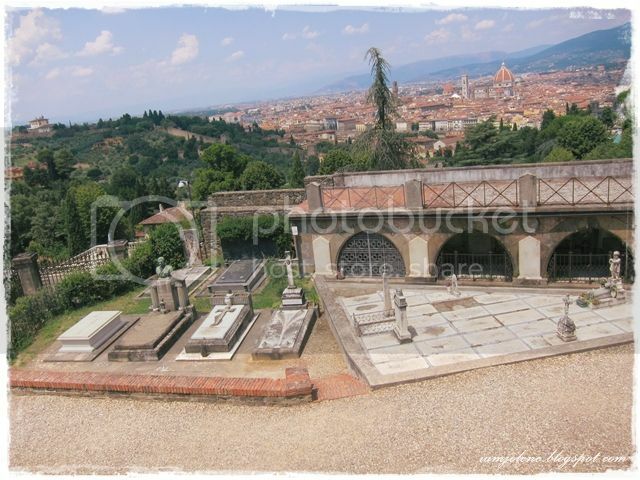 There is an adjoining Olivetan monastery and monumental cemetery. 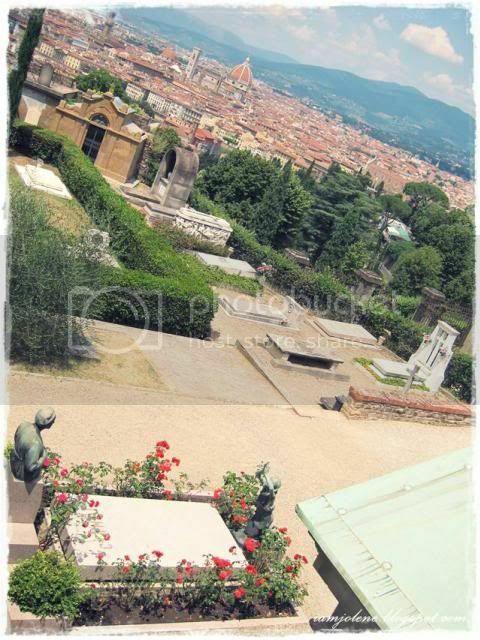 Beautiful tombs with illustrious men, such as Carlo Lorenzini (Collodi), author of Pinocchio, is being buried there. This is what it meant by having unsurpassed view of the city centre. 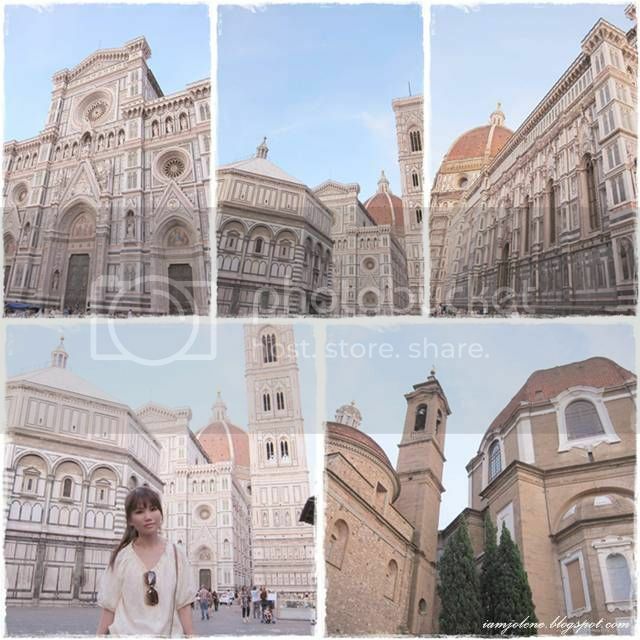 With our backs to the front of the church, we were greeted with an impressive view of Florence, from the Duomo and Palazzo Vecchio, to the last standing parts of the medieval walls that once surrounded Florence. 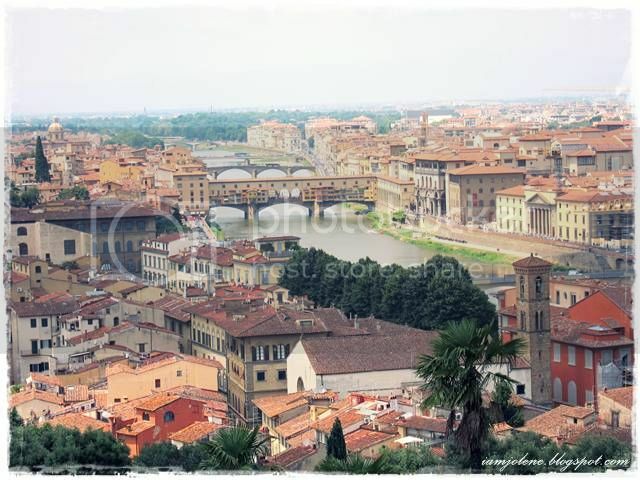 We were on higher grounds than Piazzale Michelangelo and hence there are trees framing the bottom of the cityscape. Just to stamp our mark here. This photo is aptly titled "SPACE". A forgotten door with thick layer of cobwebs and dust. I wonder what's inside. 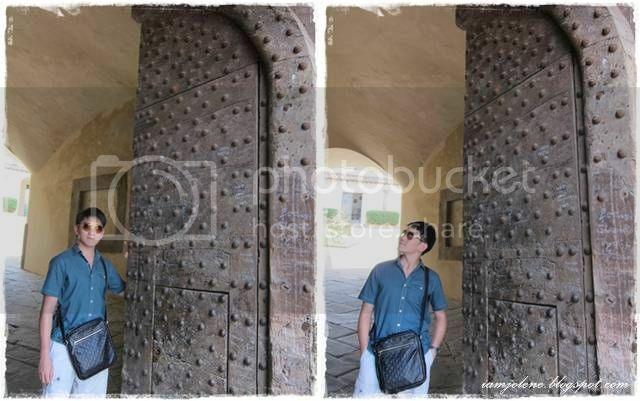 Just beside the heavy door on both sides are "holes" to look through to the outside. You could see how thick the wall is and if I were an evil blood elf, I would have shot an arrow through the head of the person looking from the inside. Along the way down, we stumbled upon this lovely spot which could jolly well be the backdrop for my ootd shot. 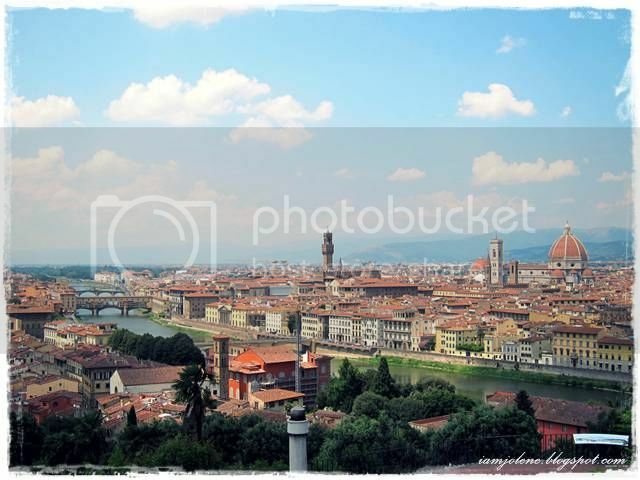 After that, we made our way down to Piazzale Michelangelo. Panning from the right, you could see the Basilica di Santa Maria del Fiore (the one with the dome), Palazzo Vecchio (the one with the dark brown tower) and Ponte Vecchio (the bridge across the river). Basilica di Santa Maria del Fiore. 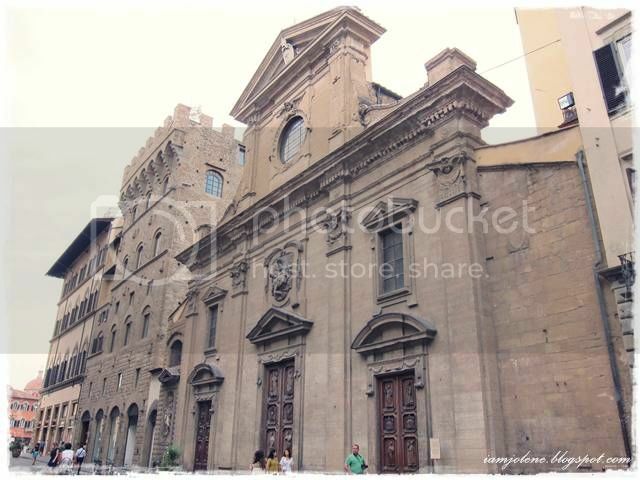 The side view of Basilica di Santa Croce (Basilica of the Holy Cross). 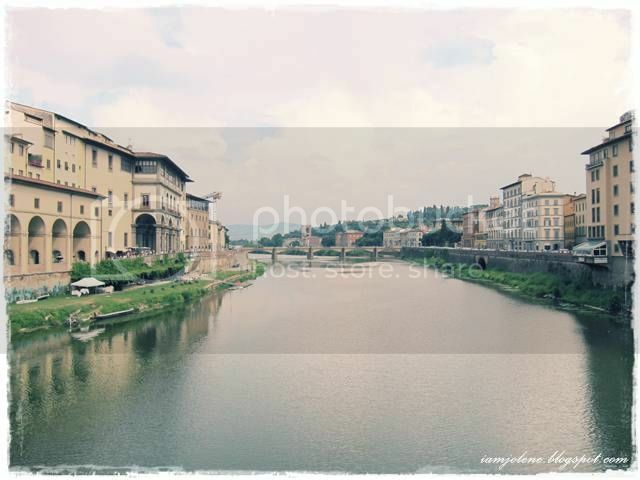 Ponte Vecchio is the focus in this picture. We left our mark on the best representation of Florence. A friendly Japanese "Uncle" offered to take this picture for us coz our Singaporean accent was soothing to his ears. He often travels to Singapore for work and loves our country. Chi Cats also left their paw prints on Florence. 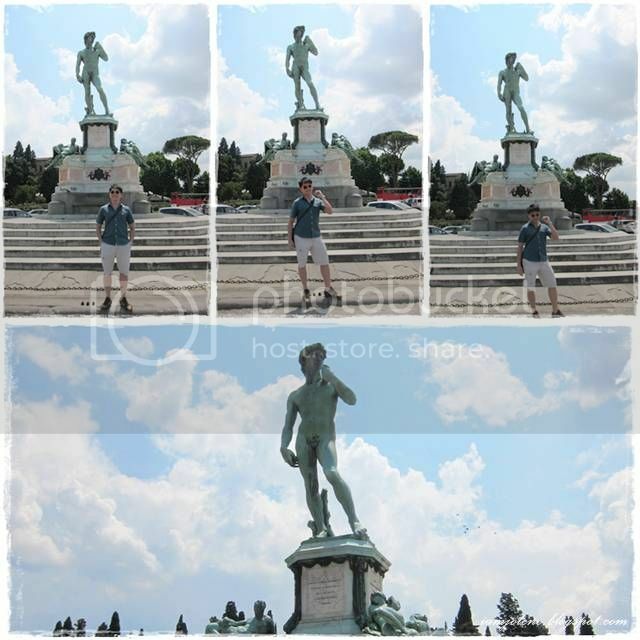 Piazzale Michelangelo's statue of David is a replica bronze cast of the original. Seriously. I don't understand the hype about David and never will. Kh doesn't understand the hype too and went on to make fun of David. 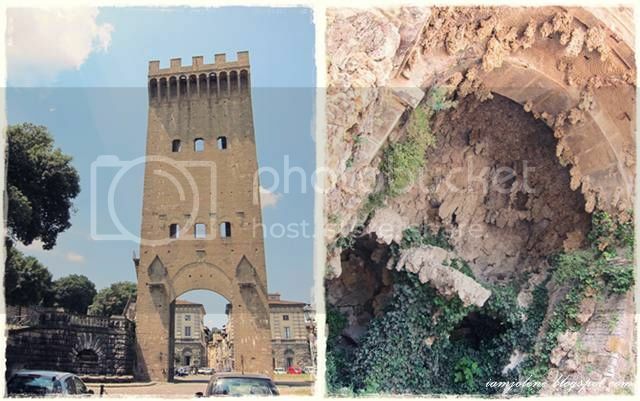 We were doing jump shots at Porta San Niccolò (Torre San Niccolo) coz we finally reached the foot of the hill once more. I cannot do jump shots for nuts and always end up with dissected frog pose in the air. While kh is au naturale when it comes to jump shots, it took me 3 tries to look like I was dancing. Hey look at my right foot carefully, it's levitating. It's a jump shot. I overestimated myself and thought I could complete Day 2 in this post. How wrong I was. 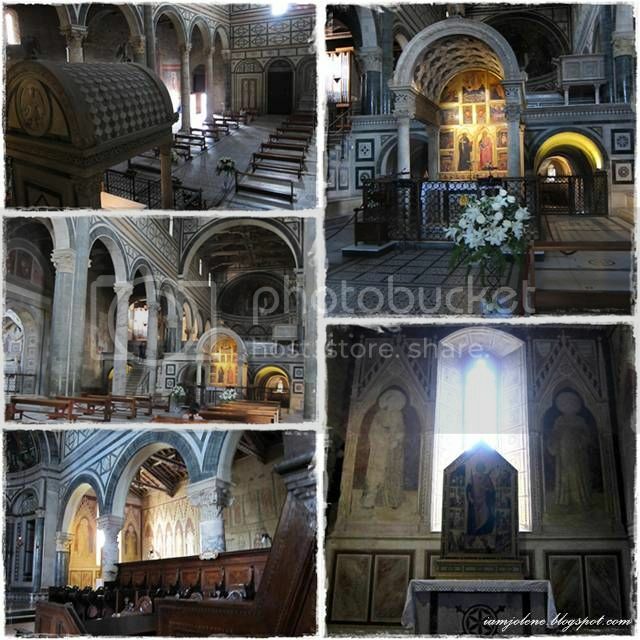 The rest of Day 2 would be combined with Day 3 as a consolidated post of museums and churches in Florence. I've replied to your comments so do check back on the posts where you left yours. I will get down to visiting your blogs as soon as I have pockets of time for relaxation. Those of you who are acquainted with me on blogger long enough would know that I don't do cursory few-seconds visit to your blogs just to say hello. I would prefer to sit down and read (at least) your (latest) posts and catch up with you properly. I'm so thrilled to see many newcomers leaving little notes here as well as new faces returning visits to my blog. I also spied a few more followers. Welcome here and thank you. I really appreciate the 2-way communication and meaningful exchanges. As for my long time blog friends, you know I always love to see all of you around. 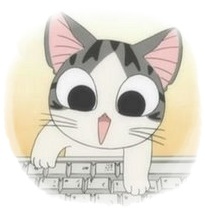 I hope to find the time to visit your blogs soon. In the meantime, keep the love coming in and happy work week/ school week to all of you!